Our second stop on our Texas adventure was again north of Austin, along this striking hillside. 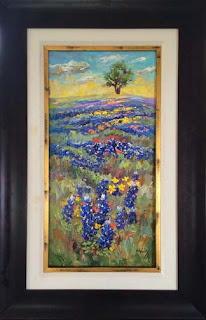 I was drawn to the one lone tree on the horizon and the patterns the bluebonnets formed leading your eye into the distance. Adding pops of color where the rainbow of wildflowers danced in between the blue also keeps your focus moving from foreground to background and back again. I hope you can feel the joy and energy of springtime in Texas! I painted these Texas Bluebonnets and wildflowers with extremely thick oil paint and palette knives to achieve depth and texture. The resulting image comes to life and is loaded with color and movement.